Credit card debt reached a record high in the United States in 2018. As a whole, Americans accrued a debt of $92.2 billion in 2017. This takes the collective total of credit card debt over the $1 trillion mark for the first time in history, according to WalletHub’s recent Credit Card Debt Study. How Does Hawaii Stack Up? In a 2017 Experian report, the consumer credit reporting agency noted a positive change in both the high scores and low scores. For the first time ever, there are more Americans with Super Prime scores (740 or above) than there are with Deep Subprime scores (499 or below). This study showed that 22.3$ had Super Prime Scores, while only 19.8% fell into the Deep Subprime range. Hawaii ties with Washington for the 10th highest credit score in the nation, with a statewide average of 693. Credit scores vary by region and state. In addition to Hawaii, New England and the upper midwest have the highest credit scores. Minnesota, with a 709, ranks the highest of the 50 states. Iowa, Massachusetts, North Dakota, Nebraska, New Hampshire, South Dakota, and Vermont all round out the top ten. Incidentally, Honolulu’s credit score is 709, matching the top-ranked state, Minnesota. In contrast, Southern states have the lowest credit ratings. The region from Texas to South Carolina averages 652. Mississippi falls into 50th place with a score of 647. According to data from the U.S. Census, this region of the country generally has higher poverty rates than the national average, which is a deciding factor in credit card usage and scores. The only non-Southern states in the bottom ten are West Virginia (658) and Nevada (655). This could explain the significant rise in credit card ownership among all age groups in the last few years. The average American now has 3.1 credit cards. Despite this overall rise in credit card ownership, research shows the higher numbers are directly tied to income and wealth. Middle class and above are more likely to have and use plastic. That being the case, it is not surprising that Hawaii – with the second highest per capita income in the country (just behind Maryland/Washington D.C.) – soars near the top when it comes to possession of credit cards. Hawaii, with an average of 3.25 cards, ranks 4th highest among cardholders. And while it is true that New England and the upper midwest join Hawaii with the highest credit scores, it is also true they hold the most number of cards. New Jersey, New York, and Rhode Island claim the first three slots. The deep South, with lower per capita incomes, ranks near the bottom. Again, Mississippi is 50th with an average ownership of 2.47 cards. Additionally, another consumer study shows that both Mississippi and Florida are the only states where secured (prepaid) cards are the most popular forms of credit. The average U.S. household owes $8,600 in credit card debt, up 6 percent in the last year. In the fourth quarter of 2017 alone, credit card debt jumped by $67.6 billion nationwide, the highest quarterly increase in the last thirty years, according to a WalletHub report. Strangely, however, income and wealth are not predictors of whether a credit card balance is maintained. Hawaii, which has the country’s second-lowest poverty rate, ranks 5th highest in credit card debt, with an average balance of $6,981. Connecticut, New Jersey, Virginia, and Alaska all carry more debt. Experian data show both Texas (high poverty) and Hawaii (low poverty) have higher debts, with balances around $7,000. 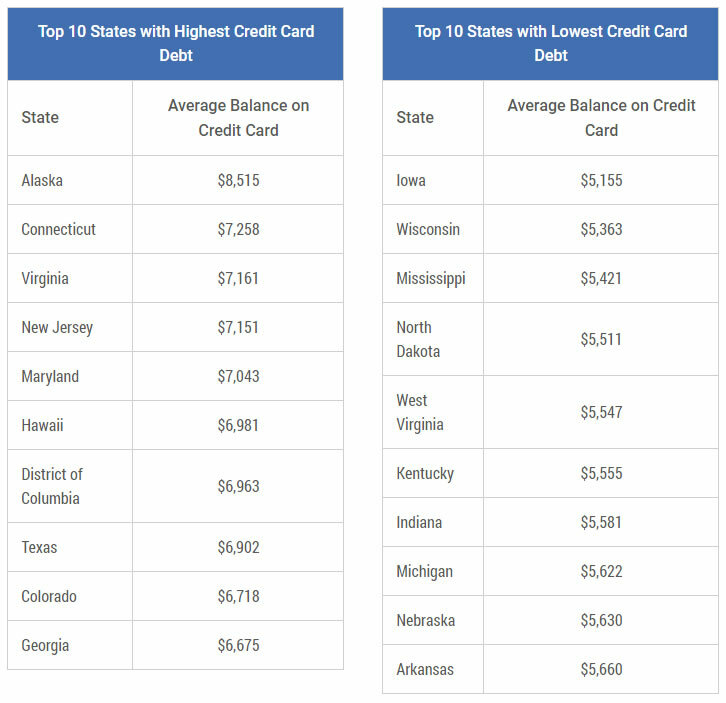 Conversely, Mississippi (the highest poverty level in the nation) and Wisconsin (low poverty) share some of the lowest credit card debt in the country, with balances just below $5,500. Another interesting statistic concerns Alaska’s debt. Though a low-poverty state, Alaska ranks highest in credit card debt with a whopping $8,515. This figure far exceeds second place Connecticut whose balance comes in at $7,258. While the reason for these rising numbers is unclear, the most likely explanation is impatience. Instant gratification causes both high-income and low-income people alike to borrow money at higher interest rates, pushing the U.S. over that $1 trillion mark in credit card debt.